BBC. Ukraine's future has sparked angry exchanges at a summit in Munich. 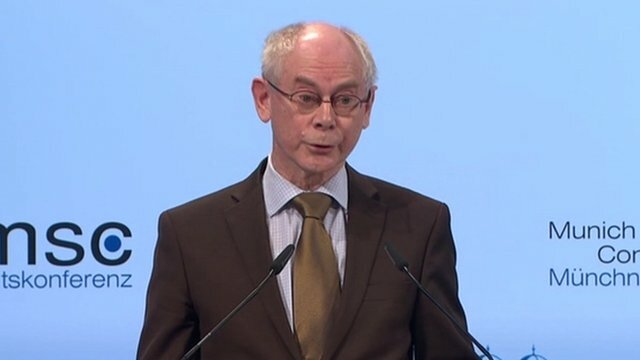 European Council President Herman Van Rompuy said the "future of Ukraine belongs with the EU" while US Secretary of State John Kerry said the US backed Ukraine's "fight for democracy". Russian Foreign Minister Sergei Lavrov accused Western countries of double standards over violent protests. The security conference is an annual event held to discuss military and political affairs. Mr Kerry launched a broad attack on "a disturbing trend in too many parts of Central and Eastern Europe and the Balkans". He said: "The aspirations of citizens are once again being trampled beneath corrupt, oligarchic interests - interests that use money to stifle political opposition and dissent, to buy politicians and media outlets, and to weaken judicial independence." Mr Kerry added: "Nowhere is the fight for a democratic, European future more important today than in Ukraine. The United States and EU stand with the people of Ukraine in that fight." He said the "vast majority of Ukrainians want to live freely in a safe and prosperous country - they are fighting for the right to associate with partners who will help them realise their aspirations". He asked: "What does incitement of violent street protests have to do with the promotion of democracy? Why do we not hear condemnation of those who seize government buildings and attack police and use racist, anti-Semitic and Nazi slogans?" Mr Lavrov said: "Why are many prominent European politicians actually encouraging such actions, although back home they are quick to severely punish any violations of the law?" Interfax also quoted Mr Lavrov as saying: "When John Kerry... says that Ukraine should choose who it is with - with the whole world or with one country, Kerry - with his experience, good sense - is the last person I would expect such propaganda from." On Saturday, Mr Kerry met Ukraine opposition leaders including Arseniy Yatsenyuk and boxer-turned-politician Vitali Klitschko. He also met Ukrainian Foreign Minister Leonid Kozhara. One key issue for Mr Kerry and the opposition leaders will be the issue of Ukraine protester Dmytro Bulatov. Both White House spokesman Jay Carney and EU foreign affairs chief Catherine Ashton said they were "appalled" by the apparent signs of torture. US ambassador to Ukraine Geoffrey Pyatt went to the hospital on Saturday to try to meet Mr Bulatov but doctors did not allow him to visit. Ukraine's interior ministry says it wants to interrogate the activist on suspicion of organising mass unrest, and to examine his account of torture.